Table tennis balls may be classified into balls for training and balls for competition. Based on the set of rules of the ITTF table tennis balls exhibit a diameter of 40 mm (before: 38 mm) and are made of either celluloid or plastic. During competitions, either white or orange table tennis balls are permitted. Balls for competition exhibit 3 stars. Balls for training commonly exhibit 1 or 2 stars. Many of those are, however, just equipped with the manufacturer´s logo. 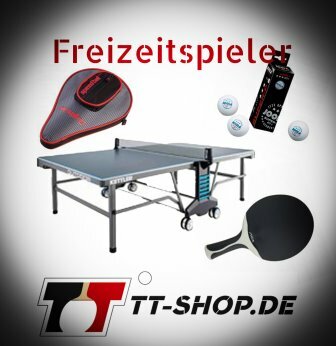 In table tennis, there are various so called pieces of sports equipment, which ware more or less essential to perform the sport. 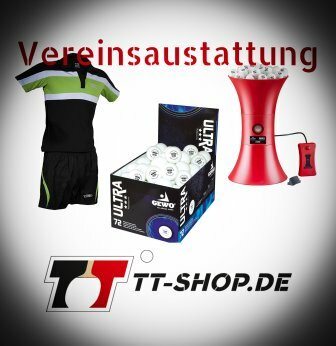 Pieces of sports equipments may be in direct (e.g. shoes or bats) or indirect (e.g. balls during rallies) contact to the athlete. In this example, table tennis balls are also essential to perform the sport. All table tennis balls are made of plastics. They consist of carbon and hydrogen atoms, which form a composite together, a so called molecule. Those molecules contain basic modules, which repeat themselves over and over again, forming even bigger molecules. For this reason, such molecules are called macromolecules (macro=huge, gigantic). Plastics may be divided into various categories. Often, they are divided into thermosetting plastics, thermoplastics and elastomers. Table tennis balls are thermoplastics: If you heat up those materials, they´ll be softer and easier to deform. If you continue the heating process, they´ll eventually melt and even go up in flames. The subsequent cooling they´ll be stiffer and harder to deform again, whereas those processes are repeatable as often as desired. As already mentioned, there are strict requirements regarding table tennis balls. If those are completely fulfilled (without any quality losses), the balls will get an imprint which consists of 3 stars. Such balls are, therefore, called 3 star balls and are approved and licensed for their use at official competitions. In case the quality of the balls is not completely consistent, they will be used as so called training balls, but also as hobby balls. Hobby balls usually have 1 or 2 stars as an imprint, whereas training balls often do not have any stars (but you can find them with 1 or 2 stars, too). It is important to know that balls with 1, 2, or no star at all still of good quality. They are useful and do not represent "garbage". Additionally, they are more inexpensive compared to 3 star balls. Among the table tennis balls, there are so called celluloid balls. Celluloid (a thermoplastic) is made of camphor and cellulose nitrate. For the production of table tennis balls, thin celluloid plates will be made easier to deform by means of heat. Then, using a technological procedure (deep drawing), they will be formed into 2 hollow spheres. Subsequently, two of the spheres are sticked together using an adhesive (acetone, which is a solvent) and heat, resulting in the final table tennis ball. The adhesive/glue seam are processed further, in order to achieve perfect roundness. Also, the TT balls will be tested with respect to various mechanical properties, such as roundness, diameter, jump and flight behavior, weight, etc. Depending on how strict the requirements will be fulfilled, the balls are classified into celluloid balls for competitions, or into celluloid balls for training purposes. The latter type exhibits a slightly lower quality, but they are not as expensive as the balls for competitions. Therefore, they are recommended for training sessions. Since celluloid is easily inflammable, those balls are manufactured and transported under strict safety regulations. Hence, they are classified as dangerous and hazardous goods. This is a big disadvantage of celluloid balls. 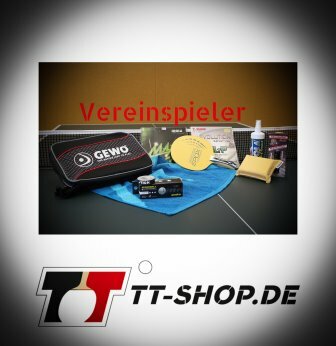 In 2014, the ITTF (International Table Tennis Federation) decided –mainly due to the above mentioned reasons– that only the new plastic table tennis balls are allowed for official competitions. For this reason, the new plastic balls were introduced. Also plastic TT balls are thermoplastics, but they are way less dangerous. Plastic balls, also called poly balls, are somewhat larger than celluloid balls (diameter larger than 40 mm). They are also harder than celluloid balls. This was done in order to slow down the plastic balls a little bit, so that table tennis would be more "visible" and attractive to the public. Another difference is the sound: Plastic balls sound duller than celluloid balls and are less elastic at impact. Furthermore, the new plastic balls are made out of one single piece (and not sticked together using 2 spheres). This results in a higher quality compared to the old celluloid balls. Of course, also plastic balls are strictly controlled regarding their properties. Therefore, they are also classified into plastic balls for competitions, and plastic balls for training purposes. Similar to the celluloid balls, plastic balls exhibit 3 stars when they are designed for competitions. They have no star (sometimes 1 or 2) when they are intended as training balls. Although in many lower leagues celluloid balls are still very common, one should consider that those balls are prohibited at official competitions. In those cases, only plastic (3 star) balls are permitted. This already suggests that decision toward the new plastic balls should indeed be considered, which is also true for training sessions! For upper leagues, the decision toward plastic balls is commonly clear already. As already mentioned, also lower leagues should think about plastic balls so that no potential will be wasted by unusual new balls. Note that also the acoustic is different between these two table tennis ball types.